We are a group of dedicated volunteer citizens committed to community service. We believe in maintaining and enhancing the quality of governance in West Vancouver through active citizen participation in the civic electoral process. Our elected board of directors has 15 members who represent the diverse cross section of our West Vancouver community and each offer a wide range of community, professional, and personal experiences. WVCGG is registered as a Third Party Sponsor under Elections BC. You can learn more about Third Party Sponsors at the following link. West Vancouver Citizens for Good Government is a non-profit, non-partisan, and non-issue community group whose mission is twofold – to inform, empower, and involve residents of West Vancouver to participate in the civic electoral process; and to encourage and support qualified individuals to run for civic office. WVCGG upholds values of neutrality, fairness, open communication, community, and respect at its core. West Vancouver is one of the most vibrant communities in Canada positively contributing to the livelihood of the society at large. Yet the low voter participation of 33% in the 2008 elections does not reflect that. WVCGG aims to ensure increased participation by all voters. We also highly value individuals who offer their knowledge, community interest, and experiences for public office. To be non-partisan and neutral on specific issues. WVCGG seeks to keep the political grandstanding interest groups out of the process of selecting capable leaders for public office. To provide all residents eligible to vote in West Vancouver with the opportunity to participate in the electoral process. To be open and fair in the democratic selection process. To offer membership to all eligible WV residents and to conduct an election cycle process that is supported by the Members. To nurture those who participate in our electoral process by fostering a respectful environment that actively supports and enhances their experience. WVCGG was founded in 1972 by a group of engaged citizens eager to see the continuation of good government in West Vancouver. At each Municipal election, we engage in a number of civic activities. A regular General Meeting is held prior to each Municipal election at which time Directors of WVCGG are elected. 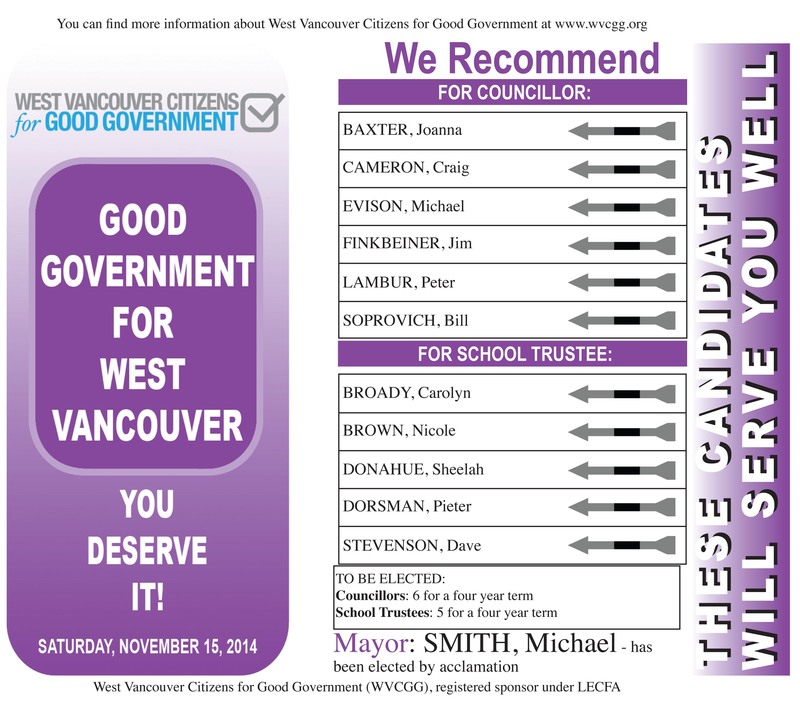 Membership is open to all residents eligible to vote in West Vancouver. Fees are used to cover the costs of meetings and endorsement announcements. A membership term covers one election cycle. Since WVCGG’s inception, a majority of Endorsed Candidates have been successful in their candidacies. WVCGG does not seek out individuals to run for office nor does it promote particular ideas, policies or philosophies. The group is nonpartisan and neutral on political policies. We promote healthy discussion to help identify the best qualified candidates to be our civic leaders. WVCGG represents the interests of our entire community. With three levels of government (municipal, provincial and federal), it can be a chore for an individual to keep fully informed for each one of the elections. By providing voters with a chance to familiarize themselves with candidates, WVCGG assists the voting citizens of WV in securing excellent government in the offices of Mayor, Council, and School Board. Each candidate is invited to participate in the process, and if they chose to do so, the Directors formally interview each candidate. The interviews are rigorous and allow for a relaxed atmosphere where conversations can be candid. Then Directors recommend certain candidates for consideration based on merit and the Members then vote by ballot to formally select from any of the candidates for endorsement. The final list candidates endorsed by members will be published in the papers and in our brochure which will be mailed out to households in West Vancouver. We encourage all civic candidates to participate in interviews and All Candidates Meetings.